Climate change is one of the most critical issues facing the world. One of the pillars of the fight against this phenomenon is the mitigation of greenhouse gas (GHG) emissions, CO2 in particular. Although many achievements have already been made in CO2 capture and storage technologies, promising methods to convert waste streams concentrated in this gas into valuable products are currently under way. This chapter intends to describe one of them, the photocatalytic reduction of CO2 to fuel products, that is, the reaction to produce fuel between the CO2 molecules and a reducing agent (usually water), in the presence of a semiconductor material that provides electrons (e−) and holes (h+) when it is illuminated by light of appropriate energy. Moreover, if solar energy were employed as light source, this type of energy difficult to store could be transformed into liquid or gaseous fuels, useful in conventional power production systems. 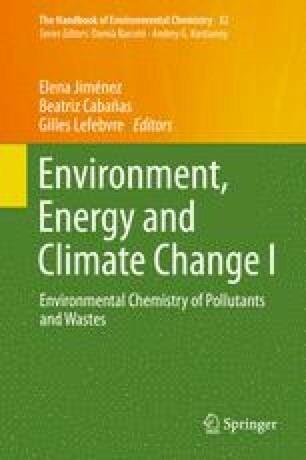 In this chapter, firstly, a wide review about photocatalysis fundamentals, photocatalysts, synthesis of particles in supercritical fluids, characterization techniques, photocatalytic reactors, etc., is carried out. Subsequently, previous results from the authors’ research on this subject are shown. More specifically, the characteristics of photocatalysts synthesized in a supercritical medium to convert CO2 into fuels are presented and discussed.